Portrait of woman facing right as she looks over her right shoulder to the left of the viewer. 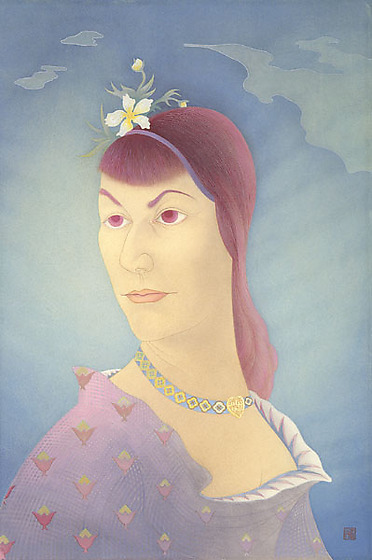 She has magenta hued eyes, eyebrows, bangs and long magenta hair pulled back by a thin purple hairband; yellow and white flower and buds with leaves appears over her hair. She wears a purple, pink, gray hued cross-hatched pattern top with pink, red and green hued florettes design and low neckline. Around her neck, a yellow patterned blue choker with yellow heart-shaped pendant at center; red design on pendent resembles Chinese written characters. Wispy green clouds on blue-green hued background. Artist's hanko (personal mark, consists of three characters that translate as "Date Hide"), lower right corner.